The brainstem is the structure situated at the base of the brain, connecting the deep structures of the cerebral hemispheres and the cervical portion of the spinal cord. It is associated with various vital functions of the body. The brainstem houses the majority of the cranial nerve nuclei, except those involved with olfaction and vision. These nuclei provide motor and sensory functions to the structures of the cranium. The brainstem also consists of important nuclei associated with parasympathetic and sympathetic functions. Moreover, efferent and afferent pathways between the cerebrum and cerebellum course through the brainstem, where they mostly decussate or cross each other. The brainstem is formed of three parts: the medulla oblongata, the pons and the midbrain. The medulla oblongata is the lowest portion of the brainstem. It is continuous with the spinal cord from below, and the pons from above. The medulla is responsible for various autonomic functions and contains cardiac, respiratory, reflex, and vasomotor centers. The pons is the middle portion of the brainstem, lying between the medulla and the midbrain. It is mainly involved with sleep, respiration, swallowing, hearing, bladder control, equilibrium, and taste, as well as various other motor functions. The midbrain is the most upper portion of the brainstem. It lies between the pons from below, and the thalamus from above. It plays an important role in motor eye movement, visual and auditory processing, in addition to alertness and temperature regulation. The cerebellum is connected to the brainstem by three pairs of cerebellar peduncles: the superior peduncle with the midbrain, the middle peduncle with the pons, and the inferior peduncle with medulla oblongata. The cerebellum is a structure of the central nervous system situated in the posterior cranial fossa. It lies posterior to the pons and medulla, separated from them by the fourth ventricle. The cerebellum plays an important role in motor function, especially in coordination, precision, timing of movement, and motor learning. The cerebellum is spherical in shape, and consists of two large hemispheres united in the middle by the vermis. It is divided by numerous transverse fissures into lobes and lobules. The three lobes of the cerebellum are the anterior, posterior, and flocculonodular lobe, which consists of a flocculus and a nodule. The deepest fissure of the cerebellum is termed the primary fissure. It marks the boundary between the anterior and posterior lobes. Another prominent fissure is the horizontal fissure, which separates the cerebellum into superior and inferior surfaces. The cerebellum is comprised of a gray cerebellar cortex, a medullary core of white matter, and four pairs of intrinsic nuclei. The cerebellar cortex consists of numerous narrow leaf-like laminae known as the cerebellar folia. These folia are parallel with each other, and are transversely oriented. Moreover, each lamina includes several secondary and tertiary folia as well. The medullary core of white matter has a complex branching system, and together with the tree-like appearance of the laminae and folia, it has been given the descriptive term ‘arbor vitae’, the tree of life. 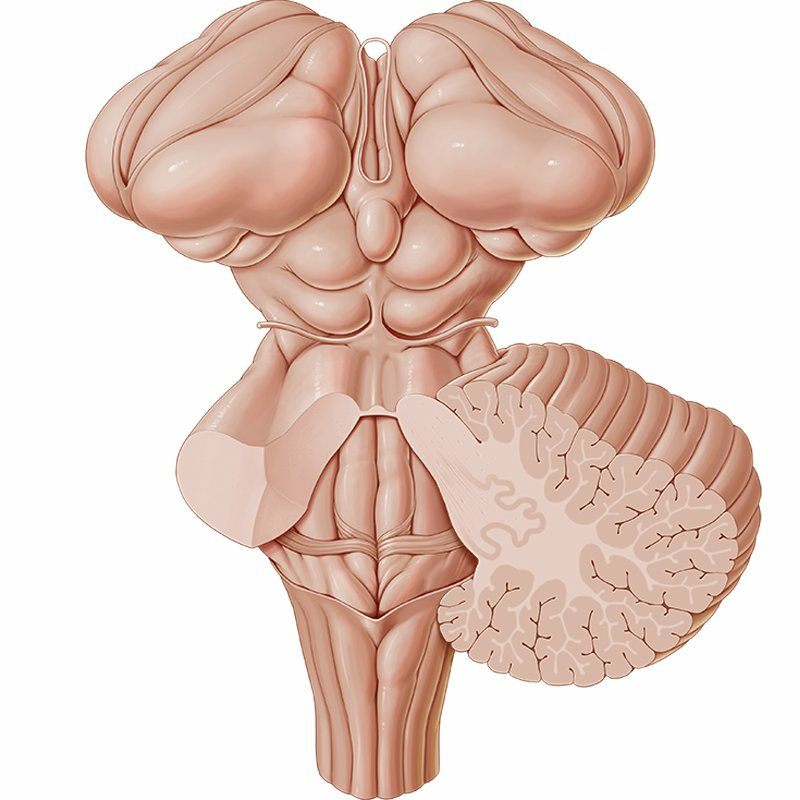 Want to learn more about the Cerebellum and brainstem? Anterior and superior views of the cerebellum. Cranial nerve nuclei in the brainstem seen from lateral and medial views. Structures of the medulla oblongata at the level of the hypoglossal nerve. Nuclei and tracts of the medulla oblongata at the level of the vagus nerve.